In the process of restoring my Clive Stuart Bike, I soon learned there was very little data on the company. 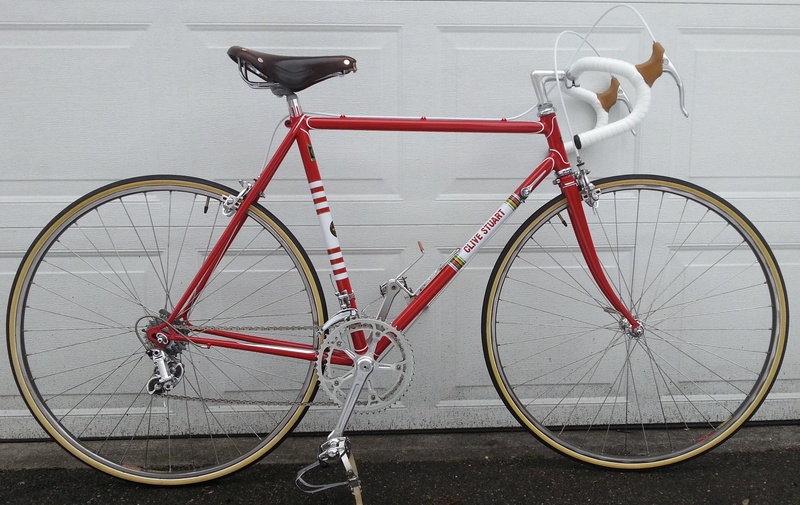 As someone in Seattle and a bit removed from England, initially I assumed that Clive Stuart was an individual framebuilder or person in the genre of a Bob Jackson, Claud Butler, Ron Cooper or Jack Taylor, little did I know.... This site was created as a place to consolidate the bits and pieces of information I was able to find and share it with others. Thanks to Paul Gittins, on Retro Bike Forums, ex-Clive Stuart Rushey Green Shop Manager, Jim Hagan and John Turner for their comments and additions. A special thank you to Jason Rourke, who was kind enough to correspond and after consulting with his father, Brian, filled in some voids of information and additional background about Clive Stuart Cycles. Brian Rourke Cycles is one of the premier cycle shops in the UK. Simon Bird, Ken Bird's son most recently shared some of his late dad's Clive Stuart race team items. Thank you Simon, I'm sure they will be enjoyed by many. Please see them on the racing team section of this site. Any corrections or additions are welcome. Clive Stuart Cycles were a British Bicycle Company located in South London. The company built and sold midrange to high end road bikes, they also operated a number of retail shops. The company was started by brothers, Clive Biddulph and Stuart Biddulph, said to be London Jewellers and entrepreneurs. Clive Stuart Cycles was in operation from the late sixties before closing sometime in 1972. In addition, the firm sponsored The Clive Stuart Cycles racing team. The Biddulphs reportedly spared no expenses with the team and led extravgant lifestyles. Stuart is still his flamboyant self and not long ago paid a visit to Brian and Jason Rourke in a new Porsche. Clive passed away in a hotel fire, while saving his son's life. He owned the hotel which was built against the wishes of many. Colorful and controversial were Clive and Stuart. South London was the home of several well, known bike companies. (Holmes, Holdsworth, Roberts, Whitcomb, Youngs, to name just a few) Consequently there were many expert frame builders in the area. The Holdsworthy Co. made most of the less expensive Clive Stuart Cycles which had plain-plate fork ends and straight gauge tubes, however the premium road and track frames were built by talented individuals that turned out bikes on par with the best. Brian Rourke and Reg Barnett were involved in production and shop management. Roger Kowalski and Paul Washington built frames for the northern area CS shops.. The high end bikes had premium lugs, Campy drop outs, Reynolds 531DB tubing and were finely crafted. These bikes were not made in great numbers and not many seemed to have survived. Please share any pictures and they will be posted. One of them, frame - builder Roger Kowalski, has sweated over bikes, in and out out the saddle, for more than 40 years. In his vast experience for several cycling companies he has built for the sport's great names — Reg Harris, Beryl Burton and Norman Shiel. "A frame is like a work of art and like the artist the builder must have that special gift in his blood," he says. Roger explained how the quality of the materials has a direct effect on a bike's performance: "If we use silver solder on the joints we can have a brazing temperature which is half that of brass. The metal retains more of its strength under lower temperature and the bike will be stronger."